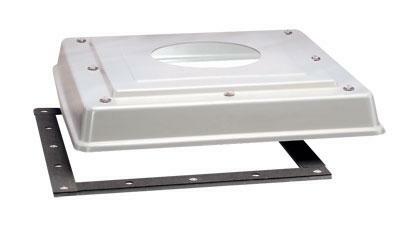 Vent-Axia roof plate assemblies are manufactured in high impact recyclable thermoplastic. They consist of a strong one piece moulded plate with extended sides to assist flashing and weather protection. A separate sub-frame is provided for permanent fixing to the roof kerb. The Vent-Axia Roof model is then fitted to the plate using a suitable sealing compound between the Cowl and plate, ensuring a weather-tight seal.